The Revolution V2.1 kit from EVCigarettes is something a little out of the ordinary when it comes to an electronic cigarette. Rather than the typical tube type configuration or simple battery box design, the Revolution V2.1 is wrapped in a uniquely styled case. Inside that case is a great battery and a juice feeder that makes for a long-lasting vaping experience. It’s worth a look for anyone looking for a convenient alternative to the typical electronic cigarette. 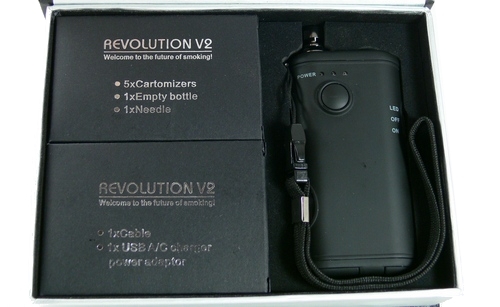 The Revolution V2.1 comes nicely packaged in a flip top box printed with the device logo and some information extolling the virtues of the electronic cigarette. Inside, the Revolution V2.1 is securely packed in a foam insert along side boxes containing the cartomizers and charger. One of the boxes is labeled as also containing the bottle and needle tip, but those came already installed in the unit. The unit itself is extremely light, only 2.9 oz outfitted with a cartomizer and half a bottle of e-liquid, but seems to be quite sturdy. It is covered in a soft rubber textured coating that gives it a nice feel but does show smudges easily. A sliding switch on the side has three positions, ON, Off and LED, which we’ll get to a little later. A well placed round button on the face activates the cartomizer and also lights three LEDs that show the state of charge – three for fully charged, two for half charged and 1 for low charge. The button has a nice solid feel and a satisfying click when depressed. The top of the Revolution V2.1 has the cartomizer connection on one side, with a well designed convex cap around it. It looks sturdy and there is no visible movement in it. The threads are standard 510, meaning that there is a wide variety of compatible atomizers and cartomizers available for use with the device. On the other side is the LED that treats the user to a six color light show when the switch is in the LED position. I am not sure of the concept behind this, other than to confuse gawkers who catch you vaping in Walmart. I would vastly prefer a single white LED that could actually be used to find my way in a dark room. On the bottom of the unit are two small doors, one for access to the e-liquid bottle and the other for a cartomizer storage compartment. This compartment is a nice touch and makes a great place to store the cartomizer when not in use or to carry an extra. The Revolution V2.1 ships with a small metal cap that looks exactly like a retracted antenna to cover the cartomizer connection when the cartomizer is removed. Getting started with the Revolution V2.1 is simple. First, the bottle must be removed from the device, which is a little challenging. The bottle fits snugly in its compartment and is difficult to get a good grip on to slide out. Once it is removed, just fill the included bottle with e-liquid, attach the needle tube, then push the assembly up into the unit. EVCigarettes adds a nice touch by including two bottles of e-liquid with the purchase of the kit. Attach one of the five included electronic cigarette cartomizers and squeeze the bottle to get juice into the cartomizer. This is where one of the only flaws in the design of this unit becomes apparent. Because the tube on the top of the bottle does not extend down into the bottle, the unit must be held upside down to fill the cartomizer. The method works, but makes it impossible to tell if the cartomizer is getting full while actually filling it. Filling the cartomizer from the top initially is recommended, then a squeeze or two will keep it while in use. Removing the small rubber tip from the cartomizer allows the user to see if the cartomizer filling is saturated, but it is necessary to point the cartomizer downward, give a few squirts and then turn it back upright to look at the filler, repeating as necessary. This lack of the extending tube prevents the Revolution V2.1 from being a true bottom feeder mod. 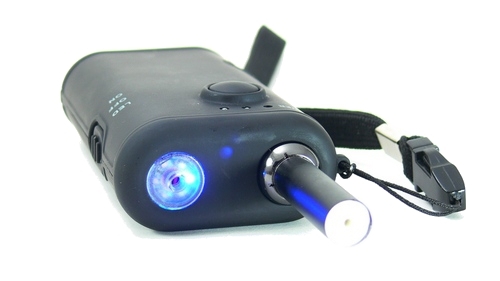 Recharging this electronic cigarette is simple, as the device has a mini USB port built into the bottom. It ships with a wall adapter and cable, but any mini USB cable connected to a USB port will suffice. While the device does not allow the use of the higher voltage when connected to USB like a true passthrough, it does allow the device to be used while charging for uninterrupted vaping. The only concern with the internal battery arrangement is the longevity of the battery, which when it eventually fails wil mean the replacement of the unit itself. The Revolution V2.1 is a very convenient variation on the electronic cigarette. The battery is stated at an impressive 1400mAh and judging from the long time between charges, seems quite plausible. The switch has a nice feel to it and fires reliably every time. The included Boge 2.0ohm cartomizers are a great fit for a 3.7v device and provide excellent flavor, a decent throat hit and quite a bit of vapor. EVCigarettes is currently including a free drip tip with non-tank kits and that makes the use of the cartomizers even more pleasurable by limiting the possibility of juice getting through. Voltage fresh off of charging measures at 4.2v unloaded and around 3.6v under load, putting the Revolution v2.1’s performance on par with some of the best of the 3.7v batteries. Being able to vape while charging and easily refill the cartomizer on the go from the internal 10ml bottle makes this device maintenance free for several days at a time. 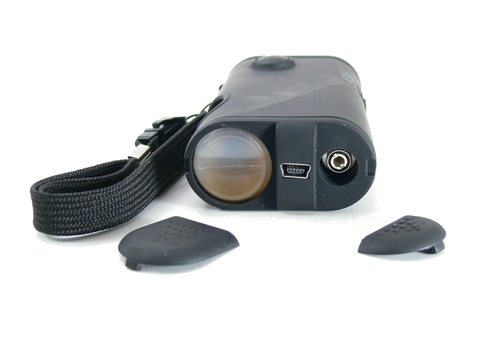 The On/Off switch and cartomizer storage compartment make it exceptionally pocket friendly. The Revolution V2.1 from EVCigarettes is an interesting alternative to conventional looking electronic cigarette kits. 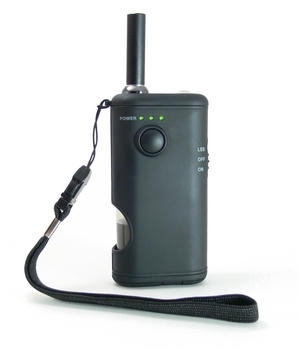 The combination of long lasting power and juice capacity make it a great on-the-go device. While it is not a true bottom-feeding mod, it can be thought of as a cartomizer with a huge backup reservoir. In this respect if fulfills its intended purpose nicely. For those who don’t like the idea of carrying a couple of batteries and juice bottles, it is a great electronic cigarette option to consider. Don’t forget to use the coupon code vapingguides for 10% off your order at EVCigarettes. Note: The Revolution V2.1 was provided free of charge by EVCigarettes for the purposes of this review. 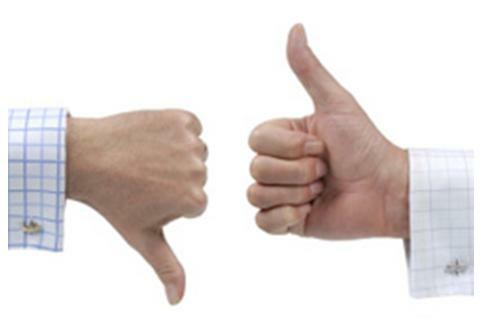 As always, I have tried hard not to let that fact influence the objectivity of the review.